What happens when you put a post-soviet nation and lots of oil money together? Chances are you end up with something like Turkmenistan, where the heads of state have decided to build some of the world’s most incredible pieces of architecture. In this top 5 made of marble and gold, find the most interesting buildings of Turkmenistan! The largest structure in the world in the shape of a horse, this stadium was purpose-built in the centre of the Olympic Complex for the 5th Asian Indoor and Martial Arts Games in September 2017. 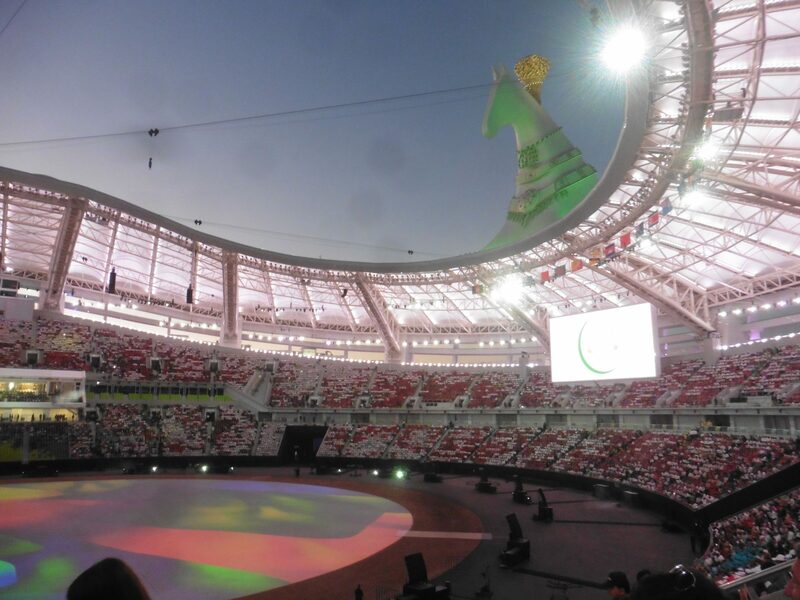 With a capacity of 45,000, the stadium was used twice – once for the Opening Ceremony of the Games on September 17th 2017, and once for the Closing Ceremony on the 27th. Unfortunately the whole complex is now closed, but the impressive horse’s head is visible from all over the city. We shall be horsing around the structure during our Independence Day Tour in Turkmenistan. Another largest of something in the world, this one is the largest structure in the shape of a star. Outside of Ashgabat, it’s built in the Kopetdag Mountains very close to the Iranian border. The only way to get there is by doing a section of the Walk of Health, which stretches 28km from Ashgabat, but sadly the section near the TV tower is almost always closed. Get a glimpse at it during our Central Asia Summer Tour. Completed in 2015, the Yyldiz Hotel is by far the best hotel in Ashgabat. Built to resemble the shape of the Burj Al Arab, the glittering white and gold tear-shaped building sits on top of a hill on the edge of Ashgabat, giving great views over the city, especially from the restaurant on the 18th floor which we visit on almost all tours. The entire hotel is extravagantly luxurious, from the chandelier in the lobby, to the sparkly lifts, to the private room in the restaurant. Conveniently though, they of course can’t acknowledge the black market, so prices in the restaurant aren’t that much different to other restaurants, but you can have crocodile, bear and chicken carpaccio. Sample these and numerous other fine dining delights on our Turkmenistan Easter tour. Costing over 2 billion USD to construct, the airport was built in the shape of a flying falcon, and with the capacity to process 1600 passengers per hour, or 17 million passengers per year. In a country which approves around 6,000 tourist visas a year. Totally resplendent, but basically empty all the time, the interior of the airport is both impressive and eerie. Fly out of Ashgabat from this airport on our Turkmenistan and Uzbekistan Summer tour.